While the climate change adaptation projects we are focusing on for the first portion of our trip are implemented through blueEnergy (bE), it is already clear from our short time here that these projects function as partnerships between communities. blueEnergy describes itself as “an international NGO committed to the most vulnerable communities of the Atlantic Coast of Nicaragua. The organization has created community development programs that improve standard of living and capacities of target populations for their self-management and self-development, respecting their cultural diversity and their rights as autonomous indigenous populations.” From our brief glimpse into blueEnergy’s Climate Change Program, we have seen (and benefited from) the trusting and respectful relationships they have built with local and indigenous communities. blueEnergy’s Climate Change Program was created with the objective of strengthening adaptive capacities and building community resilience in the face of increased extremes resulting from climate change. OPOE’s focus is a multi-faceted, adaptive capacity initiative in the Rama-Kriol Territory, funded through IBIS and the Swift Foundation. The timing of our trip to Nicaragua coincided with a field visit to the Rama community of Bangkukuk (thanks to the generous flexibility of blueEnergy), which allowed us the opportunity to gain insight into each of the project components as they are being implemented in the community. Our second week in Nicaragua started off with a day of preparation for our trip along the Caribbean coast to Monkey Point and Bangkukuk, about 45km and 55km south of Bluefields (respectively). Preparation included collecting the necessary supplies for our time in the field, the most important of which were rubber boots (given our arrival in the middle of the rainy season, these have proved to be very useful). We also spent the day doing some research and collecting our thoughts after completing a low-cost film workshop the previous week (you can read about the workshop in our previous post). We started the day with a 5am wakeup and were at the dock to catch our panga (an outboard-powered boat) out to Bangkukuk by 7:30AM. After loading up, our group of eleven was off on a very smooth ride down the Caribbean coast. The group included staff from blueEnergy, two representatives from the Nicaraguan Red Cross who were providing the emergency response training, and our team of three from OPOE. We were very lucky with the weather and made it to Monkey Point in an hour (we were told that the previous blueEnergy trip took over 4 hours because of rough waters and stormy weather). Our stop in Monkey Point was multi-purpose: first, we needed to show our papers at the local customs point, enforced by navy officials (locally referred to as ‘navales’), but more importantly, we had the opportunity to interview two participants from blueEnergy’s climate change training project. The training workshop is part of the broader work of the blueEnergy development team’s partnership with the Rama and Kriol communities in the Southern Atlantic Autonomous Region (RAAS) of Nicaragua. The project, rotating through the eight indigenous communities during a two-year period, has trained 21 youths on community-based adaptation strategies. One of the most interesting aspects of the training is blueEnergy’s focus on bridging western science and traditional knowledge to help communities adapt to the challenges of a changing climate (a topic we will come back to in future posts, our research, and film). Before we started our interviews, we needed permission from community leaders to conduct interviews and film in Monkey Point. This was a quick process, which is a testament to the strong and lasting relationship that blueEnergy has built with the Rama and Kriol communities throughout RAAS. Our first interview was with Wendy, who graciously invited us to her house for an interview on her porch. Wendy, who is 22, spoke about the value of the climate change training and how it has equipped her with a better understanding of how the changes she sees (water quality and access, health and livelihood stressors, extreme storm events, and declining fish and agricultural resources) in her community are the product of, and contributing to, climate change. While she did not shy away from the realization that the future will be hard for her and her community, she also spoke of the value of individual actions for the greater good (a theme common to our time in the Caribbean). She spoke of the need to “stand up strong” and to have courage when thinking about the future. Our second interview was with Jeffrey, also 22, and a local schoolteacher. Jeffery, like Wendy, is a training participant, and spoke about how it provided him with the knowledge to better understand the impacts of climate change and how these relate to what he is seeing in the community, including changes in rain and storm patterns and prolonged dry periods affecting water access. But, he also expanded on how these environmental impacts threaten the community’s ability to maintain their rich cultural traditions. 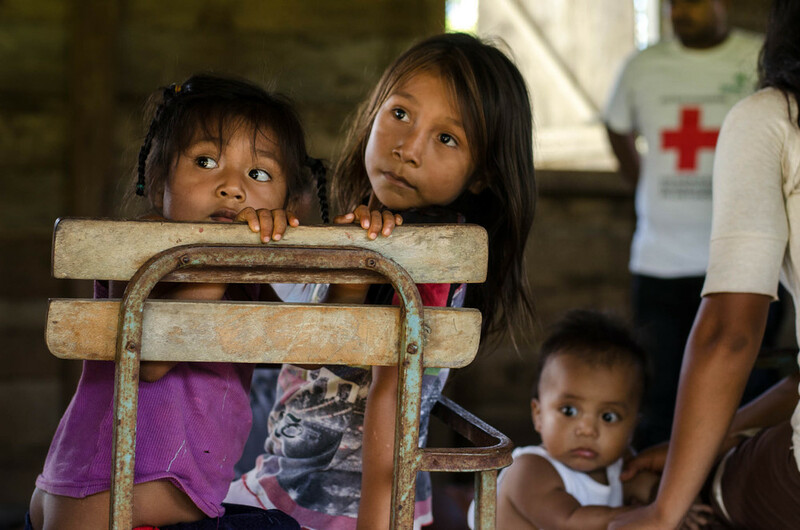 As the abundant ecological assets in the nearby tropical rainforest and sea are threatened, the Rama and Kriol people are also threatened with loosing their traditional practices, knowledge and language. While the enormity of these threats were clear, Jeffrey also presented a future of hope and a call for collective action within the broader Rama-Kriol communities to preserve traditional practices through knowledge exchange. He also listed off a series of project ideas on how the communities in the RAAS can build their own capacity and resilience to climate change; these included improving water access in times of drought by deploying back-up water tanks and by employing household scale, off-grid renewable energy technologies. While we saw projects similar to these implemented throughout the Caribbean, what was novel to Jeffrey’s suggestions was his approach. In order for these adaptive measures to be successful, Jeffrey said they couldn’t be his idea alone, but instead they need to be of the community. For these new technologies to be effective in their deployment, they need to come from the community and also support and reinforce traditional practices, not replace them. Following the training with bluEnergy, Jeffrey sees his role as both a teacher and a student – sharing information about climate change and new technologies, but also learning from elders and other community members as a means of creating a bridge between these new technologies and traditional and indigenous practices. After our interviews with Wendy and Jeffrey, we returned to the trusty bE panga to complete the last few kilometers of our journey to Bangkukuk, which is a small Rama village of roughly 150 people. We were greeted by a few community members who helped us carry our gear to the community center – our base during the four-day stay. In addition to serving as a meeting space, the community center is also designed to be an emergency response shelter (part of another climate change adaptation project funded through IBIS). After settling into our rooms, we took a short walk to visit Lina, to drop off supplies for a late lunch. Similar to the process in Monkey Point, we needed to receive permission to be in the community before we began our work, so we kept a low profile and took advantage of the quiet to prepare for the days ahead. 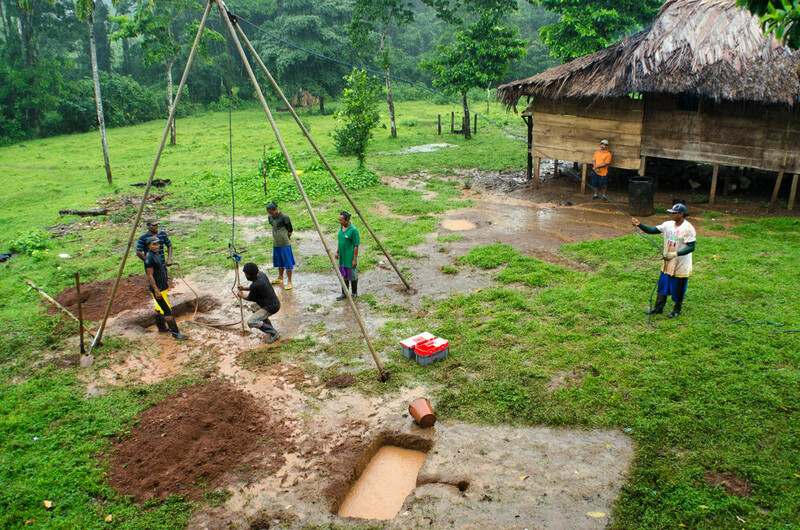 From our porch we had a view of community members digging a well using the Baptist method (an element of the current blueEnergy project). The community was using this low-cost method to drill a deeper well (just over 35ft) to provide more secure water supplies in times of prolonged drought (something the communities are seeing more often throughout the region). Unfortunately, the crew hit rock the first afternoon and over the course of our four days had to dig five holes before finding a location with water access. Just after sunset, the teams from blueEnergy, Red Cross, and OPOE met with community representatives to provide a brief presentation on why we were in Bangkukuk and to request permission to stay and work in the community. The meeting was held on the ground floor of the community center with the dim light from a headlamp and a couple flashlights. (Most households have access to electricity via individual solar panels, which feed a few indoor lights and electronic charging sources, but there is otherwise no electricity or lighting infrastructure in the community). The meeting was calm and quiet and, after a brief explanation of why there were so many of us in the community at once, we were welcomed in to film and interview – again, a privilege afforded to us through blueEnergy’s strong track record with the community. The leaders were also clear that with the impending canal project they have an immediate desire to have their story shared with the global community. (The proposed canal, if implemented, will be the largest current global infrastructure project, displacing over 200 communities and threatening the already tenuous existence of some of the indigenous communities in the Southern Atlantic Region of Nicaragua). This short introductory meeting reinforced the imperative of blueEnergy’s work around knowledge exchange and the “bridging” of indigenous and technological responses to climate change (and other social and environmental threats). As mentioned before, the main objective of their project is to strengthen the adaptive capacity of the indigenous community of Bangkukuk through knowledge exchange. The initiative focuses on the preservation and diversification of livelihoods, taking into consideration ancestral knowledge and practices in climate change adaptation. The results of the project will be published through the website “Turkulka”, informative booklets, an educative documentary and a promotional video on good adaptation practices. This first meeting quickly highlighted the question that was every present during our time in Bangkukuk: how to develop and support adaptive capacity to climate change, in the face of myriad compounding economic, environmental and social pressures, that not only restrict future adaptations, but also threaten the very existence of a community and culture? This is no simple question, but we will attempt to explore this further in our next blog post..